I arrived in Shanghai today. People’s Square was my goal. Right in the guts of the sprawling city. I almost couldn’t have been a better day to finish this ‘era’ of my journey. The sun was shining, it was clear and crisp, blue skies, no pollution, cool…and a headwind. But hey, what’s new. I left Felix’s place at around 7:45am. It was great to get on the road. I knew I only had around 60km to skate today, so I took it easy, drinking in the surroundings. I felt alive. It was as if everything was sharper than usual. The air was lighter. Sounds were vibrant. Colours were crisp. I felt a deep sense of satisfaction. Nothing like any sort of rush of adrenaline or joy. Just a stillness in my heart. I was pleasantly surprised to meet Steve Ruelle on his bike about 30km from Luxu. He had started much later than me on his bicycle, and apparently was hoping to catch me before he had to stop to get a bus the rest of the way into Shanghai. He met me just as I was about to pass the intersection that he was intending to turn at. The chance meeting resulted in us finding a great pizza restaurant nearby. My first taste of real western food for almost five months. My feeling of satisfaction continued to glow inside me. Crossing the border from Jiangsu Province into Shanghai district was like going through a time warp. I felt like a neanderthal being transported through the ages into a modern society. The roads were immaculate, there was much less garbage dumped on the roadside. I’ll be honest and say that the above photo was well and truely posed. I did tear up a little when the large ‘Welcome To Shanghai’ sign appeared, but I can’t put a finger on any particular feeling that I felt the moment I crossed the border. Just that same sense of satisfaction. My muscles and mind felt relaxed. It was by no means an easy day however. The headwind kept my speed down, and I had to take frequent breaks. From the Shanghai border to People’s Square in the center of Shanghai it was another 67km. Most of it was in semi-urban outlying areas. I was thrilled to see the French sports/outdoor store Decathalon about 20km out of the center of Shanghai as I was skating past. My trousers (that I am wearing in the photo above) were bought at a Decathalon store in Italy more than a year ago, and were now only held together by some sort of miracle. I was able to buy another pair similar to them at the Shanghai store for 15 Euro. I paid for the new trousers, went to the store toilets, changed trousers, chucked the old ones in the rubbish bin, and carried on skating. About 16km out from the People’s Square, I met a German guy out for a Sunday bike ride. We chatted as we were waiting for the lights to change. “You’re out for a biek ride?” I asked. “Yes, just biking home now. Where are you from?” he asked. “New Zealand. And yourself? Do you live in Shanghai?” I replied. “Yes. It is a nice place to live. Good roads, and nice enough people. Are you travelling around here?” he said. “Uh…yeah, you could say that. Actually, I’ve just skateboarded across China,” I told him. He nodded and smiled. A moment passed. A frown appeared on the man’s face. “What?” he asked hesitantly. “You only travelled by skateboard? Nothing else? With all that gear? But the roads must have been terrible. All the roads are terrible outside the cities in China,” he informed me. I explained that the roads were actually the most consistently smooth of any country I have been to. “Wow, that is amazing,” he said. The lights turned green, and we said our farewells. He charged ahead of me on his road bike to beat the hoards of noisy squealing-braked shopping bikes. Before long I was well and truely in Shanghai proper. Massive skyscrapers dominated the skies around me. Three story traffic interchanges sucked vehicles in one side and spat them out in all directions on the other. I pushed on past the no-cycling signs and stayed on my direct route to People’s Square. I wasn’t keen to take any detours. One wrong move and you’d be lost forever in the cluastrophobic maze of steel and concrete and asphalt. At around 5:30pm I had made it to within three or four kilometers of the square. I kept on pushing on along the main street. Traffic police and traffic wardens on street corners blew their whistles and waved for me to stop. If only they knew where I was coming from. I blew past them. I had come 12,150km, and only had a few kilometers to go till I was finished. I was not stopping for a whistle. The whistles and half-hearted calls for me to stop faded behind me. 1km out from the square, I began to recognise where I was. I recalled walking the area with Marija five months prior. I homed into the direction of the square, traffic and pedestrians funnelling into my wake. I was now oblivious to the stares that I had come to despise. 462 days ago on the 25th of June 2007, I left Leysin, Switzerland, alone. Today I arrived at People’s Square in Shanghai, alone. I had emailed newspapers in Shanghai to let them know I would be arriving. I got no response. Other contacts I had in Shanghai were on holiday, since this was the beginning of a 10 day national holiday. Hence there was no one to applaud my arrival. I asked a passerby, a stranger, to take my photo in front of the People’s Square sign. He was Chinese, and spoke no English. After taking a photo of me on my camera, he asked if he could take my photo on his camera. I agreed. He took my photo. And then he left. Just some guy on a skateboard at people’s square. There was one person that came to meet me at People’s Square however. Michele Travierso, an Italian guy I met when I was here in Shanghai five months ago. We had arranged for me to stay at his place until my flight out on the 7th of October. I called him from a payphone, and we met outside the Starbucks at the square. Did the final moments of this journey meet my expectations? Should there have been a large group of people there to greet the world’s farthest travelled longboarder at the end of the longest journey by skateboard ever? The longest in history? I achieved what I set out to achieve. 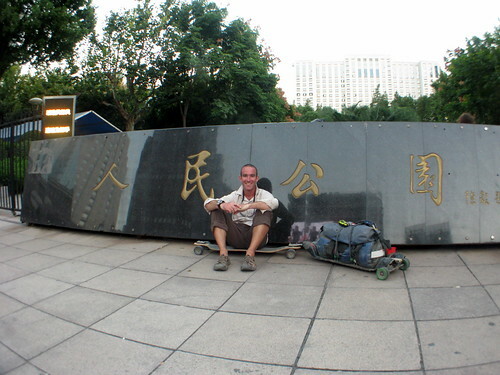 I question whether ambition, one of the largest motivating factors in me skateboarding across China, was a valid reason for sacrificing so much of myself for this mission. But I am done. Whatever the motivations were, I am done. From comments and emails that I get, I am encouraged that my efforts have not been in vain. Readers and viewers of my journey online have been inspired. People that I have met have been moved. To me, that means so much more than the single moment of arriving in Shanghai. As for me, time to take a break, me thinks. Congrats on bringing the journey to an end. As you point out, it doesn't really matter what your motivations were. The important thing is that you got out there and did something – you set a goal and went after it. Looking forward to the book (maybe you should check out blurb.com to help you with that one)! Congratulations and a lot of admiration for what you have achieved from a fellow traveler. You will profit all your life from the experiences you have made on this trip, a worldchanging event in you vita, definitely! And you surely have changed the way a lot of people see and experience the world, you are a worldchanger! I hope you will find a way back to a different life and will achieve new goals. All the best my friend! Brilliant! We're so stoked for you! What a flippin legend!!! You are a huge inspiration mate, got me wanting to walk New Zealand or something similar. Looking forward to reading the book and watching the documentary. Yey!!!!!!! Incredible journey. Now it's home to make a documentary ….. yes? Haha. You must be the only person in the world who is chilling out and feeling closure, just a few days before they bike from Auckland to Christchurch! I have been a long (really long) time reader and have to say that I was getting worried these last few trying months that this day wouldn't come. But your resolve and courage have pulled you through and you have truly been an inspiration to me. I hope to meet you one day (traveling to NZ soon-ish) so I can have the honor of shaking the hand of the man who completed the LONGEST SKATBOARD JOURNEY EVER. Congraulations! Congratulations on achieving your goal. Have a good chill out time. I suspect biking from Auckland to ChCh will be a breeze compared to the journey you've just finished. Congratulations Rob! A fantastic journey. Well done. I'll add my congrats as well, and I am truly honored to have been a part of this incredible journey of yours. You up for pizza again this Sunday? Well done Rob. Top effort. What will we do for entertainment now the prospect of regular amusement at your expense is about to end? Well done Rob! what a journey. I'd like to ask you though – how much longboard hardware have you gone through on your trip? I'm pretty interested to know things like how many wheels you've gone through (and come to think of it, how many shoes you've gone through because of footbreaking). Anyway, once again, congratulations on your incredible achievement! You've been a huge inspiration to me. Rob, that post and that video sent shivers down my spine! Let me be the thousandth person to say "congratulations!" I really mean it! Following your skate across the US and China has been great entertainment for MONTHS for me! Your skating has definitely inspired me to skate farther and push myself to improve. I'm not sure if I would've tried skating to CA if I hadn't found out about this blog! Someday it would be great if you could make it to the USA for one of James Peters' 24-hour ultra skates – around and around and around Greenlake in Seattle, WA all day and all night! (www.pavedwave.org if you don't already know) Also, it would be fun to see how well you could do in an ~8-mile cross-town race! Plenty of those during the summer! I'm in New York right now, and there's an 8-mile thru-downtown-NY race happening this weekend! It should be awesome! Congrats Rob….I spotted an article in todays "Press" (ChCh)7/10/08 then went to your website……What a fantastic journey. Awesome stuff, Rob! Gotta add my congrats to the others. Just checking e-s again after a while without them, and am stoked to see you've made it. "Well done" just doesn't cut it. But dunno what else to say. I've been praying for ya. if i could have been in china i would have came to greet you at the end of you'r journey. you deserved that much. im a little shocked nobody was there. dude your somebody to look up too, your deffinatly my idol.